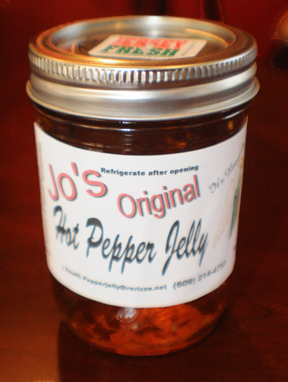 Welcome to Jo’s, home of the original Hot Pepper Jelly! Although we’ve only been in business since 2005, our product has been in our family for over twenty five years, I’ve been making it for family and friends since then. Our company is a family owned and operated business which allows us to give each jar our personal attention in every way from content distribution to sealing and labeling. 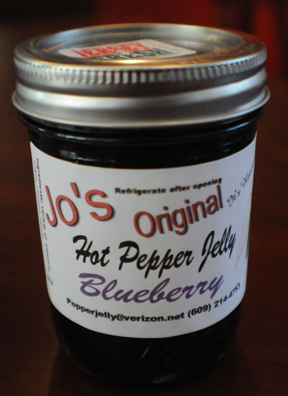 In addition to our award winning Original Hot Pepper Jelly, we have extended the line by adding Blueberry Hot Pepper Jelly, Cranberry Hot Pepper Jelly and Strawberry Hot Pepper Jelly along with an Extra Hot of the Original Hot Pepper Jelly, they are all chuck full of fresh fruit and have become very popular along with the Original Pepper Jelly.